Whenever a list of the world’s most interesting vacation spots is compiled, Kakslauttanen is sure to be near the top. Famous for its long viewing season of the northern lights, the resort features glass igloos, where guests can enjoy the sensational aurora, as well as Kelo wood cabins and luxury suites. From next winter, new Kelo-Glass igloos will combine the best of both words. Kakslauttanen’s restaurant facilities are just as exotic as the accommodation. 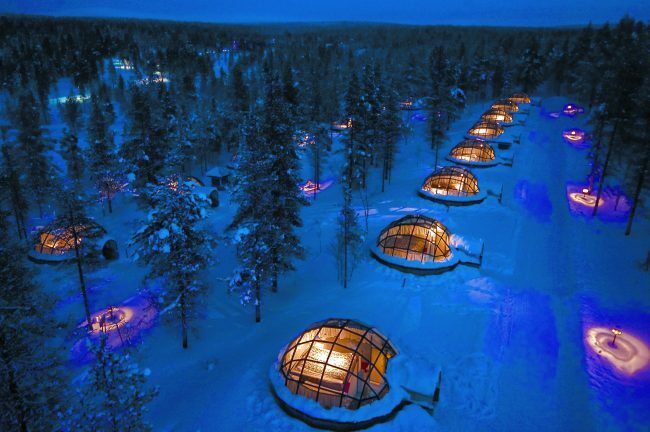 Options include spending an evening in a glass igloo bar while gazing at the starlit skies. For years, the resort has been a popular venue for weddings and honeymooners. Santa’s Celebration House accommodates up to 250 people and features the latest technology—making it perfect for weddings and corporate events of all kinds. Kakslauttanen organizes a variety of winter and summer activities to help guests make the most of every precious second of vacation time. They can even meet Lapland’s biggest celebrity, Santa Claus.